Use this subforum to make development log threads, recruit folks, and chat about development related stuff! There's also the game development subforum and the #wizardjam slack channel. was checking out just this past year's episode titles and there are some A+ options. Buble Bloodborne Beef, Momazon Prime, and Idle Thumbs Demo Disk Q1 2016 top my list. I'm in! Now I need to spend some time in the next few weeks getting some inspiration. 21 Year Old Weird House is promising! Edit: That's "Twenty Year Old Weird House." Still promising! I did the random title a couple of times and it was a theme that I was thinking about doing anyways! Now to figure out Unity!!! I'm down. Going to have a look through episode titles to see if I can find something I want to make more than Dot Gobbler, which I've been thinking about making since the first Wizard Jam. I wrote up a design idea for Always Support the Danger Layer last year. Maybe I'll make it! 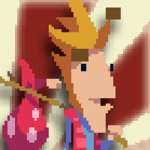 To add a bit to what ZeroFiftyOne said, a major goal of the Wiz Jam has always been to create a really positive environment for new/inexperienced games makers, so please don't be discouraged if you've never made anything before, and if you ever need help or just want people to bounce ideas off, drop by the gamedev slack channel/forum and come hang with us! We have a fun mix of new folks, professional developers, and everything in between kicking around and we're all happy to help out or just chit chat. Thanks for organising, 051! Can I suggest you look at the feedback thread from the previous jam? The main points brought up were: end time and time zone for the Jam, a post-Jam structure for playing/feedback, and encouragement in the team-building thread for people to read all the posts and not be embarrassed to make a move. If anyone would like some intro screen music or something, I made this chiptune version of the Wizard melody during the Winter Jam last year. I think Patrick has some music he made that people can use as well. Perhaps there should be a Free Assets thread? Yep! I remember there were some good points made in that thread. Thanks for the reminder. I'm totally not going to be embarassed when I make a move in the team-building thread. Woohoo! Third time's a charm, I'm actually going to make something for this one! This is a cool jam! 'The Bear's Black Heart' is such a strong episode title from the past year. I also really like 'Ms. Petman', 'Signature Moves' and 'Mesmerized, Process and Anxiety'. Though I have no idea what I'd make for the last one. That video was a great idea and really well done! It's kind of silly how much fun it (still) is to stare at the Thumbs episode list and think of different game ideas and interpretations. Hah, yeah I do the same. Every week when a new episode comes out I look at the title and think about what game could be made from it. I've already made Sir Jumps-A-Lot and Brick-Break'N Breckon. I'm just waiting for the inevitablity of those being the names of episodes.